H-Field. Any space or region in which a magnetic force is exerted. The magnetic field may be produced by a current-carrying coil or conductor, by a permanent magnet, or by the earth itself. HIC. Heterogeneous Interconnect bus provides a bidirectional serial interconnect which builds a scalable parallel system using pairs of unidirectional lines. IEEE-1355 defines the physical and Logic Link layers between a Chip-to-Chip, Board-to-Board, or Chassis-to-Chassis interface. The HIC interface is obsolete. Hierarchical Computer Network. A computer network in which processing and control functions are performed at several levels by computers specially suited for the functions performed. High Fidelity. The process of reproducing sound nearly identical to the original. High Frequency. The band of frequencies from 3 megahertz to 30 megahertz. High Frequency Compensation. See Peaking Coil. High-Level Data Link Control. [HDLC] A Link-Level protocol used to facilitate reliable point-to-point transmission of a data packet. High-Level Modulation. Modulation produced in the plate circuit of the last radio stage of the system. High-Pass Filter. A filter that passes a majority of the high frequencies on to the next circuit and rejects, or attenuates, the lower frequencies. 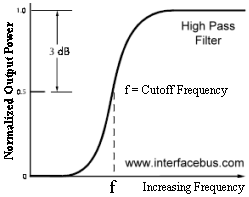 A filter that passes frequencies above a given frequency and attenuates all others. See the High Pass Frequency Response curve below right. Also called a Low-Frequency Discriminator. Refer to the entry on Passive Filters. Also see the entry on Active High Pass Filter Design, using Op-Amps. High Q. A filter or other circuit considered to have a high efficiency. High Voltage. An AC voltage greater than 1000 volts or a DC voltage greater than 1500 volts. Note that the IEEE defines High Voltage as 1000 volts AC, while the NEC defines High Voltage as 600 volts AC. The graphic represents one example of a High Voltage Warning sign. High-Voltage Probe. A volt-meter probe containing a large value resistor for measuring high voltage. High Voltage Underground Cable. High-Voltage cable is made with a conductor, conductor-strand shielding, insulation, semi-conducting insulation shielding, metallic insulation shielding, and a sheath. The sheath can be metallic and may then serve as the metallic insulation shielding and be covered with a non-metallic jacket to protect the sheath. Hiss. Random noise in the audio frequency range. Hold Current. The minimum amount of current required to keep a relay energized. Holding Coil. A separate coil within a relay that stays energized after the original current has been removed. Holding Current. The minimum required current to keep the thyristor operating or conducting with the Anode to Cathode forward biased and after the Gate signal has been removed. 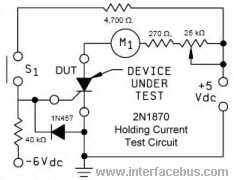 The test circuit to the right applies a momentary gate signal, than reduces the thyristor current via a Potentiometer until the device shuts off. The holding current is that current measured just prior to shut-off; when the device switches from the on-state to the off-state. Hold Time. The time required to keep the data at the input to a register stable, after the device has been clocked. The interval during which a signal is retained at a specified input after an active transition occurs at another specific input. Also refer to Metastability. Homochronous. The relationship between two signals such that their corresponding significant instants are displaced by a constant interval of time. Hookup Wire. An insulated stranded or solid wire, which is conductor free [not terminated with a connector] at both ends and used for chassis wiring and interconnecting wiring between components within equipment. Manufacturers of Hookup wire. A lead wire. An unshielded stranded wire defined by MIL-DTL-16878, as Insulated Electrical Wire, having various copper wire gauges, using a various number of wire strands, and various insulation colors. Horizontal Axis. On a graph, the straight line axis that is plotted from left to right. Horizontal-Deflection Plates. A pair of parallel electrodes that moves the electron beam from side to side in a CRT. Horizontally Polarized. Waves radiated with their E field component parallel to the earths surface. Horizontal Pattern. The part of a radiation pattern that is radiated in all directions along the horizontal plane. Horizontal Plane. An imaginary plane that is tangent (or parallel) to the surface of the earth at a given location. Horn Speaker. A type of speaker which uses a horn. Refer to Manufacturers of Speakers for additional information and vendors.